High school students and teachers will join astronomers on the cutting edge of science under a program to be operated by the National Radio Astronomy Observatory (NRAO) and West Virginia University (WVU), and funded by the National Science Foundation (NSF). The program, called the Pulsar Search Collaboratory, will engage West Virginia students and teachers in a massive search for new pulsars using data from the Robert C. Byrd Green Bank Telescope (GBT). The NSF announced a $892,838 grant to NRAO and WVU to conduct the three-year program. The project will involve 60 teachers and some 600 students in helping astronomers analyze data from 1500 hours of observing time on the GBT. The 120 terabytes of data produced by some 70,000 individual pointings of the giant, 17-million-pound telescope is expected to reveal dozens of previously-unknown pulsars. 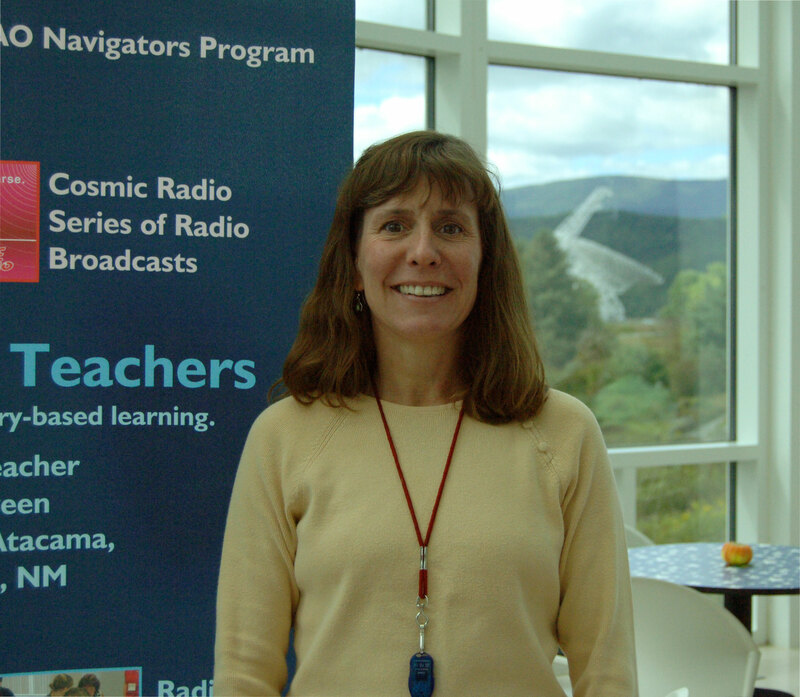 "The students in this program will be partners in frontier research, discovering new pulsars and measuring changes in pulsars already known," said Sue Ann Heatherly, the NRAO Education Officer in Green Bank and Principal Investigator in the project. Pulsars are superdense neutron stars, the corpses of massive stars that have exploded as supernovae. As the neutron star spins, lighthouse-like beams of radio waves, streaming from the poles of its powerful magnetic field, sweep through space. 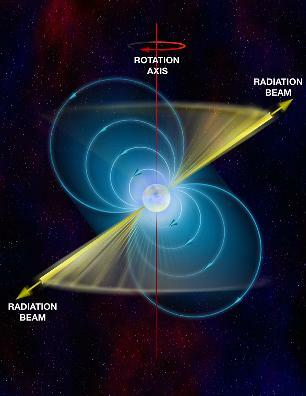 When one of these beams sweeps across the Earth, radio telescopes can capture the pulse of radio waves. Pulsars serve as exotic laboratories for studying the physics of extreme conditions. Scientists can learn valuable new information about the physics of subatomic particles, electromagnetics, and General Relativity by observing pulsars and the changes they undergo over time. 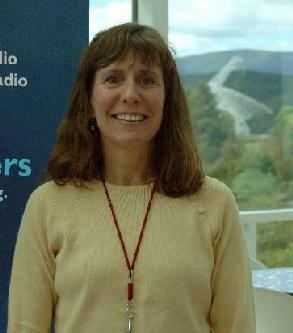 The Pulsar Search Collaboratory (PSC) combines the capabilities of NRAO and WVU to provide a unique opportunity for teachers and students to join in cutting-edge scientific research. The GBT has discovered more than 60 pulsars over the past five years, including the fastest-rotating pulsar ever found, a speedster spinning 716 times per second. At WVU, astronomers Maura McLaughlin and Duncan Lorimer are experienced pulsar specialists who use the GBT regularly for their research. The PSC program will include training for teachers and student leaders at Green Bank, and an annual scientific seminar at WVU where all participants can present their research. During the year, participants will share information through an online collaboration site called the "collaboratory," operated by Northwestern University. Student teams will receive parcels of data from the GBT and analyze the data to discover pulsars. To do so, they will need to learn to use analysis software and to recognize man-made radio interference that contaminates the data. Each portion of the data will be analyzed by multiple teams. Of the 1500 hours of GBT observing data in the project, taken during the summer of 2007, some 300 hours is reserved for analysis by the student teams. This reserved data set is expected to include tens of new pulsars and about 100 known pulsars. "Because multiple teams will analyze each portion of the data, every student in the project is virtually guaranteed to discover a new pulsar," Heatherly said. "This will give West Virginia high school students the chance to make groundbreaking discoveries like finding exotic pulsar binary systems, pulsars with planetary systems, or pulsars spinning faster than currently thought possible," McLaughlin said. The project will begin recruiting teachers in February of 2008.